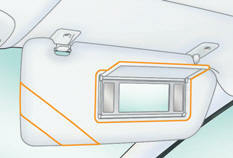 Component which protects against sunlight from the front or the side, also equipped with an illuminated courtesy mirror. With the ignition on, raise the concealing flap; the mirror is lit automatically. This sun visor is also equipped with a ticket holder.